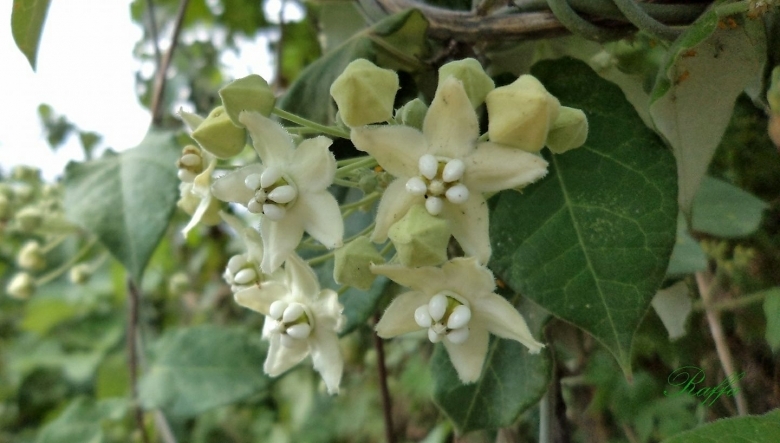 Description: The white twinevine (Funastrum clausum) is a very variable, subsucculent, herbaceous, perennial, twining and clambering vine up to several meters long. It is woody at the base and commonly forms dense mats over shrubs and into and over small trees. It includes many geographical or morphological variant that were was early classified as different independent species, but nowadays all this plants are considered part of a multiform species, where each form is linked to others by populations of plants with intermediate characteristics. It surprises that apparently it is not used as ornamental, since it has very attractive white or cream flowers with a strong and sweet aroma. The leaves are very variable in shape, size and pubescence and the inflorescence peduncles vary in size and thickness. The hairy petals and the narrow leaves are distinctive for this species. Also, the peduncles are usually as broad as the stem below them. Stem: Much branched, to 6 metres or longer, sparsely pubescent in leaf nodes or glabrous, bleeding a white milky sap when damaged, often producing runners along the ground. Leaves: (sometimes absent at flowering time) opposite, broadly oblong to narrowly elliptic, up to (2-)5-8(-10) cm long, and about 0.5-2.5(-3) cm or broader, bases rounded to subcordate, apices acute, abruptly short-acuminate, or mucronate, lower surfaces sparsely pubescent especieally on thevmiddle vein. Glands on midrib in the adaxial face, are often observed. The petioles are short (about 5 mm long). Inflorescences (umbrella-like clusters): The inflorescences are lateral, irregularly in the axils of one of a pair of leaves, their stalks longer than the subtending leaves and in its base can be present small and narrow bracts. The umbels are 7-15 flowered, all the flowers more or less at the same level, grouped in the tip of a peduncle of up to 8 cm long. The pedicels that support each flower are shorter (7-20 mm long) and generally have more hairs than the peduncle that supports the inflorescence. Flowers: About 18 mm broad, fragrant, white, creamy or yellowish. Calyx lobes (sepals) 5 lanceolate to oblong, 2.5-3 mm long, pointed, with hairs on the outside. Corolla greenish without, white within, lobes (petals) 5,elliptic to ovate, rotate and with a 12-15 mm spread, pubescent without and on the margins. At the base of the petals there are 5 globular lobes that are united towards the base forming a ring, both structures form the double crown (a modification of the stamens) that are a distinctive characteristic of the Asclepiadaceae family. The apex of the style is convex, with 2 small papillae. Blooming season: It flowers profusely for a long period (mainly in spring, summer and autumn). Fruits ripe in autumn. Fruits( 2 dry follicles): The fruits are fusiform, up to 7-10 cm or longer and 1.5 cm wide,(often one of them aborting) with finely striated surface and covered with short hairs. The fruits open along one side and release seeds with long white hairs. Seeds: Flattened, up to 6 mm long and up to 3 mm wide, with tiny protuberances on both surfaces, with a thin margin sawed towards the apex, with a tuft of hairs 2 cm long, called coma. 1) Holm, R. W., 1950. "The American species of Sarcostemma R. Br. 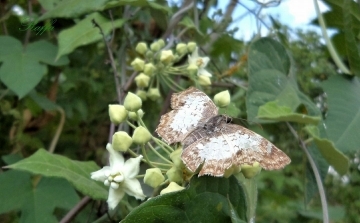 (Asclepiadaceae)". Annals of the Missouri Botanical Garden 37(4): 528-530. 2) Juarez-Jaimes, V. y L. Lozada, 2003. Asclepiadaceae. En: Davila A. P. D., J. L. Villasenor R., R. Medina L. y O. Tellez V. (eds.). "Flora del Valle de Tehuacan-Cuicatlan." Fasciculo 37. Instituto de Biologia, Universidad Nacional Autonoma de Mexico. Mexico, D.F. 3) Martinez, M., 1979. "Catalogo de nombres vulgares y cientificos de plantas mexicanas." Fondo de Cultura Economica. Mexico, D. F.
Cultivation and Propagation: Like many euphorbiads it is toxic. Its white latex is a natural source of proteolytic enzymes.